From the very first EFIS system Dynon sold, we have believed that backup power for an EFIS should be affordable, easy to install, easy to maintain, and over all else, should enhance the operational safety of the aircraft. Since a modern glass cockpit is no better than the power source that feeds it, Dynon has always offered integral backup batteries as an option for our EFIS systems. These are batteries that are truly plug-and-play. Just plug them in, and the EFIS will care for them and feed them for you. No need for the pilot to think about them or do any manual work to maintain them. No need to wire in diodes, switches, or other electronics during the install phase. The batteries Dynon uses are Lithium-Ion, the same as found in any laptop, cell phones, iPad, and almost all other modern portable device. Lithium-Ion chemistry has the advantage of having very high energy storage for the weight of the battery, which makes it ideal for use in aircraft. Of course, there are some risks with Lithium-Ion batteries, as most pilots are aware from issues with the Boeing 787. A common misconception about Lithium-Ion batteries is that they can “explode”. What really happens to a battery is that it overheats and goes into thermal runaway. At a certain temperature, the chemicals inside begin to self-oxidize, releasing oxygen and fueling their own fire. This is a process that can lead to a big fire for sure, but it is a slow process, taking minutes or even hours, not an explosion. 1) The battery pack itself includes a protection circuit right next to the battery cells. This circuit protects the cells from undervoltage, overvoltage, overcurrent (including a dead short), and too much charge current. If it detects any of these, it just disconnects the output wires. This means that the battery is protected inside, right at the cells, so external failures are highly unlikely to lead to a battery cell failure. a) The batteries have a much longer shelf life. While you want your backup power system to give you as much backup time as possible, you want it to do this 5 years from now, not just for the first few months after it was installed. b) Lithium-Ion chemistry becomes less stable as you charge the battery more. By staying away from the extreme charge state, we give the battery a lot of overhead to deal with other situations. 3) No voltages in SkyView higher than the charge voltage of the battery. Thus, no software failure in SkyView can lead to an over-charged battery. 4) Our EFIS systems charge the batteries slower than the maximum rates. This keeps the cell temperatures down, and is generally less stressful on the batteries. 5) The EFIS battery management checks for overcurrent, and over or undervoltage on the battery. Thus, both the EFIS charge circuit and the battery protection circuit would need to fail in order for any out of spec voltages or currents to occur. 6) The SkyView battery is in a plastic case . While this may seem counter-intuitive, one of the larger dangers in Lithium-Ion battery packs is the fact that many cells are in close proximity, and one cell can heat another. By being in a plastic case, if a cell overheats, the case will melt and allow the cells to separate, rather than forcing them to stay in proximity like a metal case would. 7) SkyView self-tests the battery on each shutdown. This looks for serious issues that may indicate the battery is damaged, and warns you the next time you turn the system on. Just like everything in a plane, there is a balance between different kinds of safety. 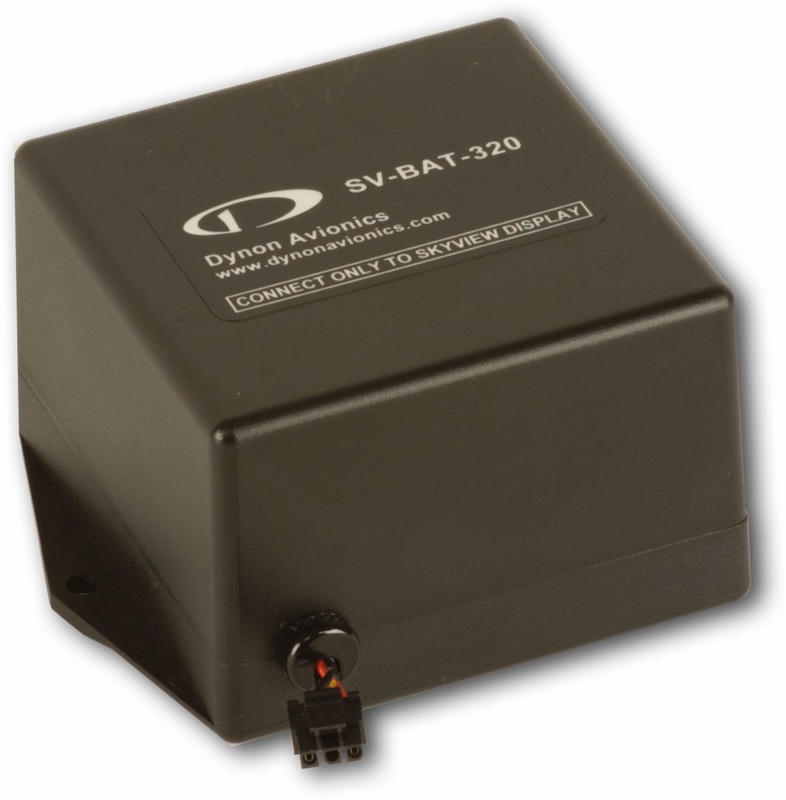 We believe that all of the protections we have designed into the Dynon EFIS batteries and systems provides an overall increase in safety by giving our pilots a reliable, easy to use backup for their EFIS systems while keeping the chance of any thermal issues with the batteries to a minimum. We are proud of our record of reliability of these systems over the last decade.